Nice way to support the Deer Valley community, if anyone is interested. Looking for something to do this week? 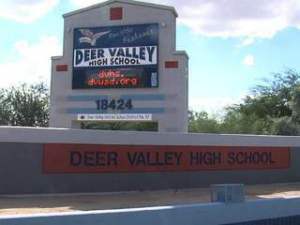 Why not support one of the local schools, Deer Valley High School. located at 18424 N 51st Ave, Glendale, AZ 85308. The dance classes will be performing their first show on Wednesday December 3rd– Friday December 5th. All shows start at 7pm. Tickets purchased before the shows are only $5 or $7 at the door. This is a great way to show your support. My daughter will be performing in the shows and yes I will be there every night. Hope to see you there.